Two bombs exploded today in a shopping centre in Ahwaz City, an ethnically Arab-dominated city in the province of Khuzestan, the Ahwazi Arab homeland. Early reports suggested four people had been killed and over 100 injured, but the number of casualties is likely to rise. Today's bomb attacks come at a time when Iran is facing increased pressure over its nuclear programme. 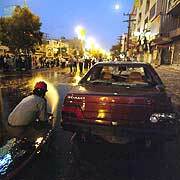 Ahwaz City witnessed similar bomb attacks in June, in the run-up to the presidential election, killing eight people. These explosions were caused by high-grade plastic explosives. Ahwazi separatists were blamed, with the Mohi-eldain Martyrs Guerrillas claiming responsibility for the attacks, although the group disbanded in the 1980s. Nasser Ban-Assad, spokesman for the British Ahwazi Friendship Society lobbying group, said: "These bomb attacks tend to happen at times most advantageous to the Iranian regime and the majority of deaths are Arabs. The nature of the explosives - which could not possibly be produced in the backroom of an Arab slum dwelling - and the time and place the attacks occurred lead us to suspect that the bombs were the work of the Iranian security forces. "The regime is keen to discredit the Ahwazi movement at a time when it is gaining considerable strength and challenging the state. This provides a motive for car bomb attacks on shopping centres and streets where Ahwazi Arab civilians are present in large numbers in an attempt to dent the movement's popularity. No Ahwazi group would ever support attacks on its own people. "The regime also wants to portray such attacks as having foreign involvement, but despite claiming to have arrested the culprits for the June attacks on Ahwaz City, the government has failed to produce any evidence to substantiate these claims or put the alleged masterminds on trial. President Ahmadinejad is bound to claim British involvement in the attacks as a way of diverting attention from his own involvement in terrorism in Iraq and elsewhere." Ahwazi Arabs have held numerous anti-government demonstrations this year in protest at the Iranian regime's ethnic cleansing policy in Khuzestan. Thousands of Arabs are being forced out of their homeland to other provinces. The majority live in some of the worst housing conditions in the Middle East, with unemployment and poverty levels of over 50 per cent. With the Ahwazi homeland containing 90 per cent of Iran's oil resources, the plight of the Ahwazi Arabs has been compared to that of the southern Sudanese or Nigeria's Ogoni people. Following a visit to Khuzestan in July, UN Special Rapporteur on Adequate Housing Miloon Kothari condemned the regime's policy of land confiscation towards the Ahwazi Arabs, which he said was raising poverty levels.